What can be done about motorbikes hitting riders? Despite the great racing on show at Openingsweekend, Sunday saw the return of an ugly issue in cycling, as two more riders fell victim to crashes caused by race vehicles. Today’s main event, Kuurne-Brussel-Kuurne, saw Lotto-Soudal’s Stig Broeckx abandon with a broken collarbone and rib, while in the La Drôme Classic, BMC’s Danilo Wyss was denied a chance to compete for the win after a collision with a motorbike. These latest incidents follow a spate of crashes involving motorbikes towards the end of 2015, including Peter Sagan and Sergio Paulinho (both Tinkoff-Saxo) at the Vuelta a España, Greg Van Avermaet (BMC) at the Clásica San Sebastián, and Jakob Fuglsang (Astana) at the Tour de France. Earlier in the season Shimano neutral service cars took out Jesse Sergeant (Trek) and Sébastien Chavanel (FDJ) at the Ronde van Vlaanderen. Ex-president of the Association of Professional Cycling (CPA), Cédric Vasseur has already called for action from the UCI. The UCI is not serious in facing this problem. They talk and say they will brainstorm, but it’s not about that now, you have to act at this point. The motorbike driver must be sanctioned, the race organiser must be sanctioned, otherwise, it’s the law of jungle. Before we get to the UCI and what they have done to help, lets first take a look at their rulebook. What regulations are in place to try and prevent this kind of thing from happening in the first place? 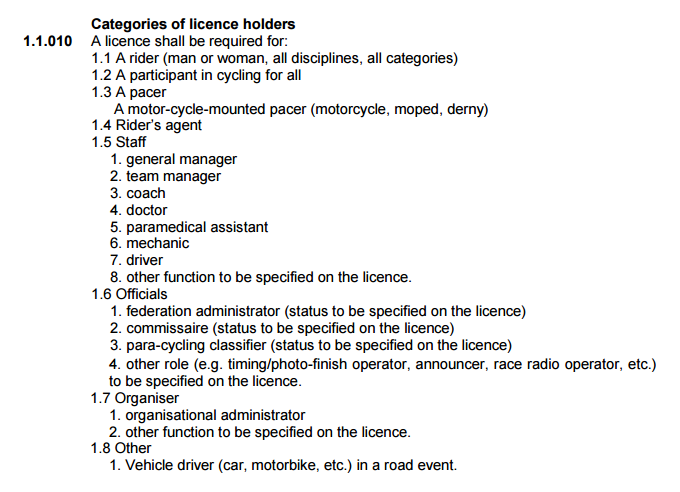 Well first of all, everybody wishing to be part of the race convoy in any UCI event is required to possess a license allowing them to do so, per regulation 1.1.010. This rule was extended to include media vehicles in July 2013, in response to the Hoogerland/Flecha incident during the 2011 Tour de France. Anybody who wishes to obtain said certificate has to attend a UCI-run course, details of which were released just last Monday. Presumably this course includes some sort of skill-based driving test – imagine a bunch of journalists and directeur sportifs waiting in line to slalom a saloon car in and out of traffic cones as an Aigle-appointed official watches on with his clipboard. That’s what journalist Paul Maunder thought too, at least until Rouleur Magazine sent him to a course in Albertville, south-east France for an article in issue 59. Maunder describes a Power Point presentation, the gist of which can be summed up as “Make sure you always have the right documentation, stay away from the race and.. always obey the Commissaires,” followed up by a collective signing of the register to confirm their attendance. This was what a UCI driver’s course looked like last summer, after the incidents at the Ronde van Vlaanderen. Remember that the people who caused those crashes, as well as the incidents later in the year, had all sat through the same course. While regulation 2.2.051 states that everybody must listen to the commissaires. Regulation 2.2.073 tells motorbikes to keep their distance from the riders. Then there is regulation 2.2.053, which deals with the punishments to be doled out should a driver not hold the required license. Fines range from 1,000-10,000CHF, while the institutions involved are banned from races for up to six months. This rule specifically mentions the press though, and there do not seem to be any regulations concerning the punishment of non-press drivers apart from this note. So, sure there’s a regulation telling motorbikes not to get too close to riders, but the drive of the rulebook is more about protecting the sanctity of the racing rather than doling out basic road safety advice. Last September, the UCI’s Road Commission met to discuss and review the regulations in the wake of the crashes at the Vuelta. Since then though, as we have seen many times before, things have gone quiet. Have the UCI changed anything? It’s hard to tell if they don’t say anything, though after Sunday’s events we will surely hear something. While there is no one solution that can guarantee no more crashes, there are a number of ideas to help prevent similar incidents occurring again. Last September saw both Tinkoff-Saxo and BMC release statements suggesting that the number of vehicles involved in races be cut down. Currently there are motos carrying television cameras, radio reporters, photographers, neutral service mechanics, police, commissaires, race timing equipment, as well as the occasional water bottle moto and the addition of motos to help with the new-fangled telemetry tracking. Not to mention the plethora of cars in the convoy. That seems like an awful lot, and while many are necessary in order for a race to function, surely not every vehicle on the road is vital. Given the nature of these accidents – the fact that many (Sergeant, Fuglsang, Van Avermaet, Paulinho, Sagan, Broeckx) can be attributed to a lack of spatial awareness and misjudging gaps or rider movements – it seems clear that there needs to be a more conservative and predictable style of driving. Better judgement is certainly needed, though can it be taught? Beefing up that driver’s course and making it mandatory for those wishing to join the convoy of lower-ranked races seems a smart step. On a more basic level, perhaps limiting speeds when vehicles are navigating groups of riders, or making the presence of motos known more easily would be good ideas. Then there’s the question of punishment. If the regulations aren’t helping to keep riders safe, and clearly they aren’t, then surely these drivers who endanger the riders shouldn’t be in the sport anymore? It sounds tough and possibly over-the-top to kick someone out for causing one accident but if you consider the risks that these drivers have been shown to be willing to take, isn’t it better to be safe than sorry? Cycling vehicles: the solution part 1, part 2, part 3. Race vehicles are essential in order to keep races running smoothly, but when incidents like these continue to happen it is clear that something needs to be done. When drivers continue to makes mistakes and take the risks we have seen them take in the past year it is plain to see that neither the regulations, nor the training given, is adequate. Hopefully the sport’s governing body take notice of BMC manager Jim Ochowicz, who once again called for action to be taken. In an already risky sport, the additional chance of serious injury or worse is unacceptable and if ever there was an issue for the UCI to act swiftly on, this is it.